Pediococcus acidilactici is a facultative anaerobe bacteria. Pediococci exert antagonism against pathogens through the production of lactic acid and secretion of bacteriocins, bacteria-killing compounds, known as pediocins. 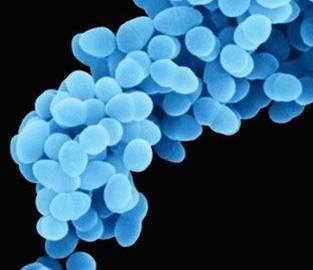 Pediococcus acidilactici has a wide range of potential benefits of which are still being studied. Though it is being used as probiotic supplements in treating constipation, diarrhea, relieving stress, enhancing immune response among birds and small animals, human trials are still limited. Pediococcus acidilactici is also known to prevent colonization of the small intestine by pathogens like Shigella, Salmonella, Clostridium difficile and Escherichia coli among small animals. Pediococcus acidilactici have been used to treat dogs with digestive disorders and also those dogs which were infected by Parvovirus. Prior to treatment with orally administered mixtures of Pediococcus acidilactici and Saccharomyces boulardii the dogs diagnosed with parvovirus infection were shown to exhibit severe gastro-intestinal distress such as vomiting and bloody diarrhea. After the treatment for three days, the bloody diarrhea ceased and the dogs had solid stools. 4. Lin J.J. 2006. Probiotics as alternative Biomedicines for pets with digestive disorders. Proceeding of 8th Annual meeting of JBVP. 3-288-292.